One is the first woman to fly an F/A-18 on a combat mission for the Marine Corps. The other is a former Miss America who traveled the country advocating for children. And both are "pink wave" Democrats challenging GOP incumbents in "red" states in the 2018 midterm elections. “I think as women, we have sort of woken up a little bit,” Lt. Col. Amy McGrath said on ABC News’ "Powerhouse Politics" podcast with political director Rick Klein and senior congressional correspondent Mary Bruce. McGrath is running in Kentucky’s 6th Congressional District against Republican Rep. Andy Barr — who will have Vice President Mike Pence campaigning at his side this week. “The reason why we have 19 percent women in places like Congress is because we don’t run at the same rate as men. And I think one of the things we‘re starting to realize is we have to step into the arena,” McGrath said. McGrath grew up in Kentucky. She knew from a young age that she wanted to fly fighter jets — but it wasn’t until her senior year in high school that Congress lifted the ban on women in combat roles. She graduated from the U.S. Naval Academy in 1997 and has served in Iraq and Afghanistan in a career that’s spanned 20 years. Lt. Colonel Amy McGrath stands beside an F/A-18 in Virginia Beach, Va., where she was part of a squadron in 2007. 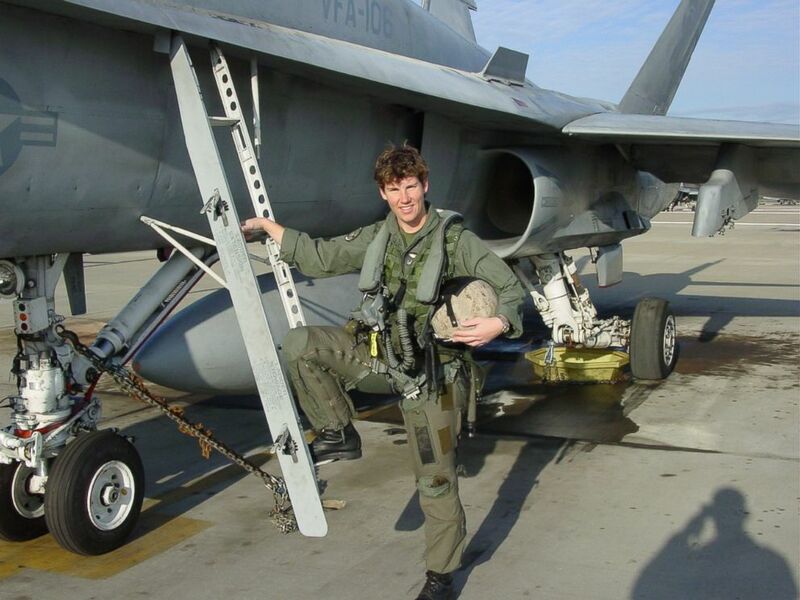 McGrath, running as a Democrat for a House seat in Kentucky, was the first woman to fly an F/A-18 in combat for the Marine Corps. A mother of three, it’s her first time running for political office after a long career in public service. McGrath acknowledged it’s about the age-old mantra: Be the change you want to see. And Mallory Hagan, who was crowned Miss New York and then, in 2013, Miss America, cited the same inspiration for her campaign. She’s running in Alabama's 3rd Congressional District against an incumbent who’s held the seat for longer than a decade, Republican Rep. Mike Rogers. Miss New York Mallory Hytes Hagan is crowned the new Miss America during the 2013 Miss America Pageant at PH Live at Planet Hollywood Resort & Casino, Jan. 12, 2013, in Las Vegas. “We need more diversity at the table. We need gender diversity; we need racial diversity. And we also need generational diversity,” Hagan said, also speaking on ABC News’ "Powerhouse Politics" podcast with Klein and political reporter MaryAlice Parks. Both Hagan and McGrath said they recognize there was more to President Donald Trump’s election than political disagreement: constituents felt a lack of communication with those in office. They said they’re running on a broader message than that of any one party. “I’m not running against President Trump and his agenda. I am running against the world that we are beginning to create,” Hagan said. And although Trump spurred her run, McGrath finds common ground in the attraction to an outsider on the ticket - the reason she says many in Kentucky voted for him. 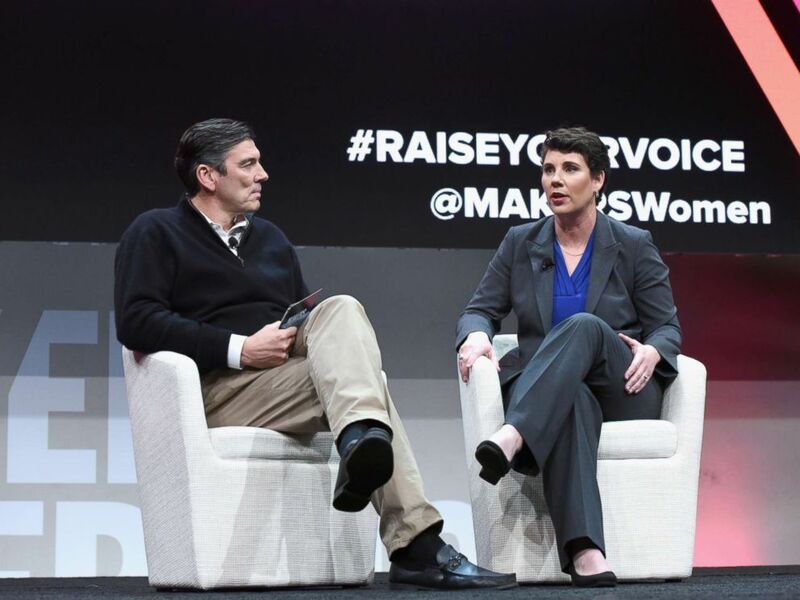 Chief Executive Officer, Oath, Tim Armstrong and former U.S. Marine and congressional candidate in Kentucky Amy McGrath speak onstage during The 2018 MAKERS Conference at NeueHouse Hollywood, Feb. 6, 2018, in Los Angeles. Lack of faith in the establishment is one of the reasons McGrath isn’t concerned that the Democratic Congressional Campaign Committee, or the DCCC, hasn’t backed her. “We’re seeing that the well-funded, sort of ‘having the establishment backing’ doesn’t really help you. In fact, you know people are sort of tired of that — they don’t trust the Democratic National Party. Many Democrats in Kentucky don’t. They are looking for somebody who is honest,” McGrath said. Another view the candidates have in common: a moderate stance on gun control — a touchy subject in their southern states. McGrath is a gun owner, she said, and Hagan said she grew up with her father’s guns in the house. Her number one concern? “Make sure our politicians are not bought off by special interests,” McGrath said. Hagan, who said she considered buying a gun herself when she lived in big cities - New York and Los Angeles - said she thinks background checks and longer waiting periods should be a priority. Miss America 2013 Mallory Hagan celebrates National Pancake Day at IHOP, Feb. 5, 2013, in Hollywood, Calif.
“I see nothing wrong with the Second Amendment. No one wants to take away anyone’s rights in that arena. But I do think we can start with some things all of us agree on,” she said. Gun safety will be just one of the issues both Hagan and McGrath face on election day — but as Hagan put it, there is a battle to be one in just running. “When I looked at Congress and saw that there were only four women under the age of 40, I said you know maybe this is the time, even if I don't win — which I am planning on doing — but even if I don’t, I’m setting an example and inspiring some other people who are in my age range to get involved in their community,” Hagan said. This is part of a continuing series of interviews on the “Powerhouse Politics” podcast with first-time candidates in the 2018 midterm elections.